Day 15: How much good fat is too much? So it brings me to the question: how much good fat is too much? When you have a spoonful of almond butter in the morning with your banana, an avocado on your salad, a handful of almonds as a snack, and sautee your veggies and chicken in coconut oil for dinner, you’ve racked up a substantial amount of fat, yet this is the basis for a pretty common paleo diet day; so is this okay? Self.com says that about 30% of your daily calories should come from fat, so around 60 grams. This amounts to about 2 tablespoons of nut butter, 1 tablespoon of olive/coconut oil, 1 ounce of almonds, and 4 ounces of salmon. Add some chia and flax seeds and you’ve got good fat galore. Unfortunately, too much of a good thing doesn’t make a great thing. So while I could eat half a jar of Justin’s Almond Butter, I think maybe we should just work on spreading it out. The Huffington Post claims a different stance, Dr. Hu says that as long as your fats come from good sources (like avocados, fish, and nuts), then there’s no need to count. Narrowing to nuts specifically, Active.com says that in the case of walnuts, almonds, pistachios, and pecans, the benefits outweigh the fat. They even go as far as to say that they are important for runners because “they have an anti-inflammatory effect on the body, and can help repair tiny muscle injuries that can cause inflammation.” Finally, Kat Loterzo emphasizes that fat MUST be organic, because fat stores toxins, and we don’t want to be eating toxins. Put it all together and what do we get? Well your intake is obviously going to be mostly determined by what kind of diet you are trying to follow, how you prepare your food, and how much you even like these sources of good fats. My viewpoint kinda falls in the middle of all of these sources. If you are consuming high quality, healthy fats, then you really shouldn’t have to look too closely, but if you do notice a large amount of your calories coming from fat, just try to cut back on the excess. Maybe have one tablespoon of almond butter with your banana instead of two, use the least amount necessary of olive/coconut oil to sautee your chicken and veggies in, and stick to a small handful of nuts if you need a quick snack. I know that if you’re eating all whole, natural foods it really shouldn’t matter too much what your exact calorie counts are, but I get a little obsessed sometimes and count every gram and morsel. Don’t drive yourself crazy! Trust me, it just does more harm than good (aka ending up at, “f*** it gimme some ice cream”). Just remember, everything in moderation. I’ve tried to keep that mantra in mind with my meal plans, but I’m certainly not perfect. Saturday I had some Applegate Farms Natural Maple Chicken Sausage and some fruit before my 4 mile run. In the middle of my run I was thinking, “wow this run is terrible, I don’t really want to have to blog about how I haven’t improved at all.” But I was proved wrong. At the end of my run, my RunKeeper app alerted me of my fastest average pace ever! Shows how much I know… post-workout was a yummy smoothie with banana, almond milk, nature’s bounty complete chocolate protein, chia seeds, and just a spoonful of almond butter. Dinner was grilled swordfish with broccoli and quinoa cooked with spinach and mushrooms. Sunday before I hit the gym I made some oatmeal with organic rolled oats, a spoonful of flax and chia, some honey and blueberries. I went to BodyPump class and was reminded how much I enjoy it. Not going to lie, I have definitely neglected my strength training trying to get all my running in for the half marathon. Weight training again made me feel great, so I’m going to try to do both on some days in order to get more in. My grandma was in town, and for lunch she took us to one of my favorite places: J Christopher’s. It was so hard to stay healthy with so many tempting choices, but I opted for their “Billy Goat” omelette which had mushrooms, sun dried tomatoes, goat cheese, and spinach. I had it made with egg whites, and instead of potatoes and an english muffin I opted for turkey bacon and fresh fruit. I didn’t feel like I missed out at all, it was totally satisfying! I love little healthy wins like that. Dinner was Paleo Pesto Chicken Pizza which you can find the recipe for here. Today’s breakfast was egg whites scrambled with mushrooms and spinach in a little coconut oil with a banana. Lunch was my favorite kale salad (be on the lookout later this week because I have it in my meal plan to try a new kale salad recipe, this one includes blueberries, yum!). Today’s run was absolutely horrid. It was rainy and freezing, and the wind picked up just as I turned around so I had to work against it. My post-run snack was totally worth it though because it was amazingggg. 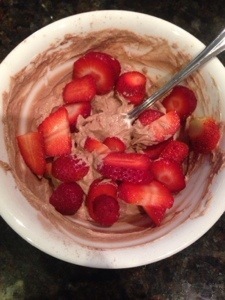 I took a few spoonfuls of plain Fage greek yogurt and mixed it with one scoop of Nature’s Bounty Complete Protein powder, whipped it into a mousse consistency, and topped with some fresh strawberries. Y.U.M. Tonight’s dinner was one of my favorite paleo recipes that I’ve tried on this journey: Paleo Pad Thai.